Today the WWE released footage of their long lost territory, Southpaw Regional Wrestling. The lost episodes feature announcers former Utica News Announcer (For 6 weeks) Lance Catamaran, his inebriated broadcast partner Chett Chetterfield, and backstage announcer Clint Bobski, delivering you the news old-school action from the likes of forgetful SRW Champion, John Johnson, Tex Ferguson, Big Bartholomew (with Christian Joy), Pelvis Wesley The Surf Dudes With Attitudes and more as they gear up for big event: Lethal Leap Year, At the County Fairgrounds on February 29th at 8PM. Southpaw Regional Wrestling also features hilarious ads from a “Ric Flair Impersonator” advertising meet and greets at KFC. The series is full of old-school territory references, but this dated territory has a surprising 90’s reference. Thankfully, Twitter user Judekilgour found it. 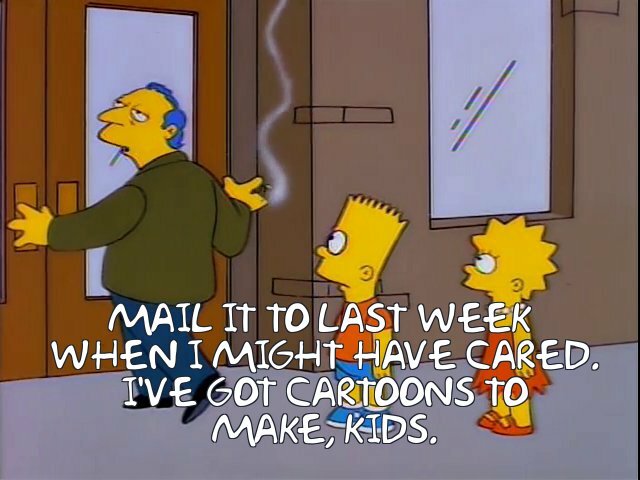 As big Simpsons enthusiasts, we caught this too…but we already mailed it back to a few hours ago, when you might’ve cared. So, awesome catch, Jude! This only makes us love Southpaw even more. And if you’ve yet to catch Southpaw Regional Wrestling, you can watch the entire series here on the site! (Or WWE.com, but we could use the hits) Enjoy and let us know what you think! This entry was posted in Snapshots, WWE and tagged Big Bartholomew, Cesaro, Chett Chetterfield, Chris Jericho, Christian Joy, Clint Bobski, Heath Slater, Homer Simpson, Impressive Pelvis Wesley, John Cena, John Johnson, KFC, Konnor, Lana, Lance Catamaran, Leathal Leap Year, Luke Gallows, Mr. Plow, Ric Flair, Rusev, Southpaw Regional Wrestling, Tex Ferguson, The Ascension, The Simpsons, The Surf Dudes With Attitudes, TJ Perkins, Viktor, WWE, WWE.com. Bookmark the permalink.